I started out as an emergency physician and worked in a busy ER for upwards of 25 years. During that time, I was slapped, punched and kicked — several times — and had to wrestle with many out-of-control patients. A patient peed on my leg. I was pooped on — don’t ask. One patient pulled a knife on a colleague in a small exam room. A good number of guns were found by me and my colleagues while cutting clothes off trauma victims. And guns were found hidden in the waiting room! Though I myself witnessed no shootings during my ER years (thank goodness), gunfire in emergency departments across the country has not been uncommon, and staff members have been among the victims of these shootings. But interestingly, no one ever said to me during my ER days “Wow! Aren’t you nervous about working in that dangerous ER?” That is because most people have been in an ER and so know from experience that overall these are not really dangerous places. On the other hand, most people have not been in a correctional facility. All they know about jails and prisons is gleaned from movies and books. And in movie-land, danger sells. So how dangerous are my jail medical clinics? Well, during the 15 years that I have been working in correctional medicine, nothing has happened like my ER experiences. Not once! The worst that has ever happened to me in my jail clinics is that my patients have occasionally yelled at me. 1. Weapons are forbidden in correctional facilities. The jail deputies do not carry guns while on duty in the jail. This is not because they don’t carry firearms. Just like patrol officers, detention deputies are issued a service weapon — and they are expected to carry it when not in the jail, even when not on duty. But when detention deputies come to work at the jail, they secure their weapons in lockers at the jail entrance. No guns are allowed in the facility — at all! 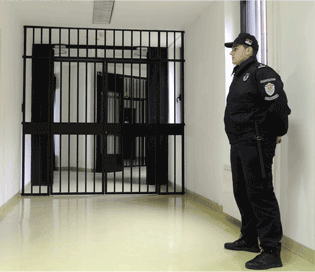 Most jails and prisons require all employees and visitors to go through an airport-like metal detector to make sure that no weapons end up in the jail. 2. Inmates in jail and prison are, for the most part, sober when I see them. It is hard to stress how important this is! The worst patients in the ER were those who were drunk, belligerent and wanting to fight. Inmates in the jail medical clinic have sobered up and so are that much less belligerent. 3. Even if a jail inmate wants to fight, I don’t have to be involved. Burly detention deputies are always nearby. Though we try to safeguard patient privacy as much as possible, in a jail, safety and security take precedence over privacy. This means that security staff are always close, so they can respond immediately if need be. During most clinical encounters in my jails, the detention deputy is situated just outside the room to allow some privacy, but still be able to respond immediately if something happens. if an inmate has a high enough security level, one deputy (or even two) may literally stand right next to me. 4. Inmates are punished for acting out in clinic. This rarely happens in an ER. But in a jail, the punishment is no joke. Ill-behaving inmates can lose privileges (like not being able to buy from the jail commissary or the loss of visitation rights), be transferred to maximum security status or even face additional criminal charges. Nothing dissuades bad behavior more than swift and sure consequences! 5. Lastly, I can terminate a clinic appointment, knowing that I can see the inmate patient again in a day, or even in a couple of hours. He is just in his cell down the hall. This is my “go to” response to someone swearing at me: “We’re done now, but I’ll see you again in a little while after you have calmed down.” In the ER, I had to put up with bad language, because if I kicked a patient out of the ER, I might never see them again. That was likely my one and only chance to make the diagnosis. Of course, I am not saying that inmate-on-staff violence never occurs in jails, because it does. By far and away, however, most of this involves the security officers, not the medical staff. Thank goodness for them! At least in the yard clinic, there seems to be 2 competing forces that are starting to collide. Patient privacy vs provider safety. While I do believe that patient privacy is important, at what extent do we compromise when it comes to provider safety. While there is always an officer in my clinic within 10 ft of my office door, I am expected to see the inmates with the door closed. Some officers have insisted that the door has to be locked (it is a double lock door) to keep the inmate being seen safe from other inmate that may be walking the hall in transit. I am ok with the concept of a closed door but a locked closed door seems to be disregarding the provider safety. While doing my residency, I seem to recall that the ER had a room for seeing mental health patients and there were 2 doors. One close to the patient to leave if they felt unsafe and another door close to the provider in case the provider needed to leave quickly. I think the 2 door model in correctional clinics is prudent. However, I do not believe there are any studies that have looked into this. Overall, I do agree that correctional medicine tends to be safer than the average medical clinic.